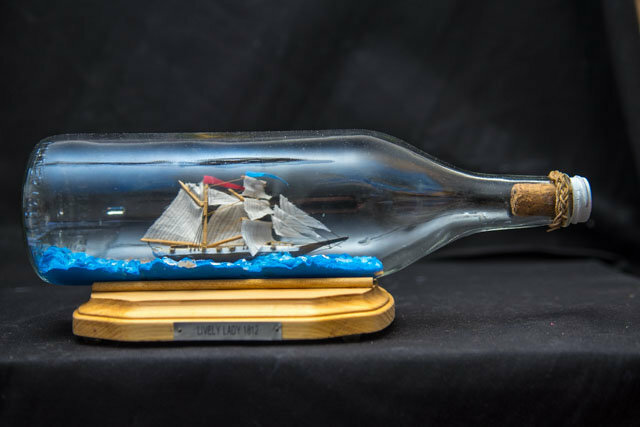 I had not built a ship in the bottle model since some time in the early eighties. All my scratch built models were given away as gifts and the only model I had in my possession was the first model I had built, a kit build from the 1970’s. 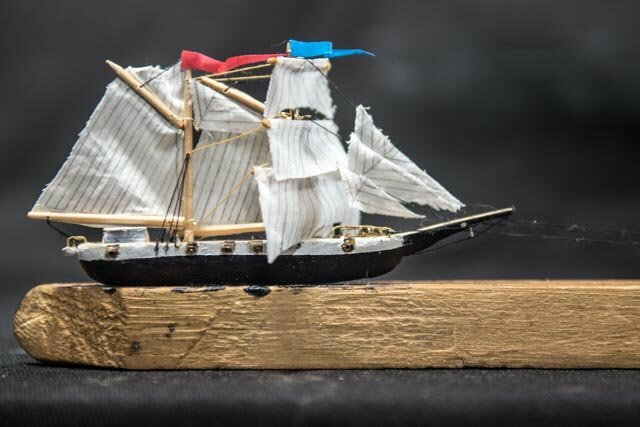 Through a series of circumstances I once again came back to building ship models. I was surprised that my eyes have actually improved for close work with my age and I can take my glasses off to work small. And my hands are still steady enough, hopefully having been practiced from years of fly-tying and art drawing. In a fit of clearing out possessions I found a partially built Model Shipways “Elsie” 1/8” scale Gloucester Fishing Ship model and a box with my old ship in the bottle collection of materials, books and the instruction sheets from my old kits. I sat down and finished the “Elsie” model which probably took me over 150 hrs of work to complete - I even added sails. I learned a lot about modeling and ships by doing this and I also learned the value of having good plans to work from. So now I wanted to reprise my first SIB kit build, “the Lively Lady” that I clumsily cracked the foremast on when mounting the ship in the bottle. I still had the “Ship’s A Sailin’” instruction sheet and the first thing I noticed was that not all the drawings were to scale or even the same scale so I first set up a “canon” to work to. I did a little research and surmised that the “Lively Lady” was not a historical model so without exact plans it’s hard to hold to any degree accuracy or feel too constricted. However, I did apply some of my ship knowledge acquired from building my “Elsie”. I even had some left over kit materials that I could use and I had a large quantity of sail cloth left over from my “Elsie” build but I had to carve the hull from scratch and make all the masts and spars from dowels. I even had a small collection of liquor bottles my dad had saved for me from his bar-tending days and I picked a bottle that is a bit long for the model but I just wanted the practice of doing an SIB again. I remembered from my other builds that I had first made putty seas from some old plumber’s putty colored with some artist grade oil paint but switched over to “Plasticine” which was available in the 1980’s. Now all I could find in the local craft store was a kid’s modeling clay something like “Play –Dough” which is a bit too cool of a blue for a sea but that’s what I could find. The bottled model didn’t photograph as well as I’d like, maybe due to the curvature of the glass playing with the lens elements of my camera. I have to say the model looks more impressive in life. But I did take a “before launch” shot of just the ship. I even attempted a “Turk’s Head” knot on the bottle neck but only accomplished a “decorative braid”. I just had one small mishap which probably only I can detect but I consider that a general hazard of putting a ship in a bottle. Overall, I was encouraged by my attempt and have decided on a course progress to continue building. Great work. I think she looks awesome. If your looking for plastaline for your next sib check out hobby lobby or Michael's. Thats where I buy mine. I hope the play putty works out for this one. Sometimes it drys up and cracks. I've had plastaline in bottles that are five or six years old now and look like the day I put it in.